"Very fast service - I had to get a crown put in and was in and out within 30 minutes!" "She's always attentive to my needs. I couldn't recommend her enough!You won't regret it." "Dr. Rayet is the finest dentist roaming the planet. Prompt, professional, and pain free." "She is very fair and reasonable, and NICE! Don't look any further than Dr. Rayet!" "Dr. Rayet and here staff are amazing. I would recommend her to anyone." "Awesome prices and REALLY beautiful clinic. Highly recommended!" 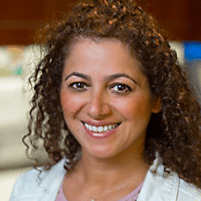 Dr. Azita Rayet is a leading dentist in Marina del Rey with her practice being easily accessible from the surrounding areas such as Venice, Playa Del Rey, and Playa Vista. Dr. Rayet provides the most advanced dental care in state-of-the art facilities designed to maximize patient comfort, from regular cleanings and routine checkups to simple and complex restorations and cosmetic procedures, Dr. Rayet is skilled in helping each patient choose the best services and care options for optimal results. Dr. Rayet is a firm believer in providing patient education during every office visit to help patients keep their teeth and gums as healthy as possible between appointments. Her commitment to offering patients the most advanced treatment options means every patient can feel confident in the care they receive. In addition to restorative and preventive care, Dr. Rayet is highly skilled in cosmetic procedures aimed at helping patients look and feel their best. Many cosmetic treatments she provides can also help patients avoid more serious problems such as tempomandibular joint disorder (TMD), decay and tooth loss. Dr. Rayet understands each patient has unique oral health needs. She works closely with her patients to develop comprehensive individualized care plans for more complex restorations or full mouth cosmetic enhancements so every patient can experience the best results possible. After earning her bachelor of science degree at the University of North Texas, Dr. Rayet completed her degree in dentistry at the Herman Ostrow School of Dentistry of University of Southern California (USC). Following graduation, she has continued to pursue continuing education opportunities, including earning certification as an Invisalign provider. She is a member of the California Dental Association (CDA) and the American Dental Association (ADA), and speaks English, Spanish and Farsi. Soft Touch Dental is a leading dental practice in Southern California, providing patients in and around Marina del Rey with top-quality care for a broad array of general and cosmetic dentistry needs. Conveniently located on Lincoln Boulevard and easily accessible from Venice, Playa Del Rey, and Playa Vista; Soft Touch Dental is equipped with the most advanced state-of-the-art equipment and technology so patients can feel confident they're receiving the safest, most effective and most appropriate treatment, no matter what their needs. Providing skilled and compassionate care for patients of all ages is an art in itself, and Soft Touch Dental is committed to providing the highest level of care possible, offering patients a complete array of treatments and procedures, from preventive care, gum disease treatment and routine cleanings, to advanced restorative care including tooth-colored fillings, dentures, bridges and root canal therapy, to cosmetic options like veneers and whitening treatments. For patients with alignment issues, the office also offers the popular Invisalign® orthodontic system, designed to help both teens and adults have beautiful, straight teeth without the hassle of traditional metal braces. The staff at Soft Touch Dental takes their time to understand the unique needs of every patient so they can provide the ideal solutions for optimal results. And of course, every plan of care is carefully considered and discussed with the patient so they understand their options and how their treatment will help them have the healthiest teeth and gums possible. The office accepts all major insurance plans, and the staff is always available to discuss financing options so you can have great-looking teeth and healthy gums without straining your budget. Call the office today to schedule an exam and learn how we can help you maintain your beautiful, healthy smile. To save you time and allow our team more time to get to know you and your dental needs, patients can now complete their new patient forms ahead of time. Dr. Rayet is highly skilled in cosmetic procedures aimed at helping patients look and feel their best. She works closely with her patients to develop comprehensive individualized care plans for more complex restorations or full mouth cosmetic enhancements so every patient can experience the best results possible. Dr. Rayet accepts major insurance providers. "I've been going to Dr. Rayet for several years and she's great. Her staff is very professional and they really do a great job." "That was the least unpleasant dentist visit I have ever experienced. It was almost relaxing. Dr. Rayet is truly talented, skillful, and considerate." "No matter what condition your teeth are in, Dr. Rayet will treat you with dignity and make them better. Dr. Rayet is as good as dentists get." "They're professional, honest, gentle, answer all your questions and are efficient. You leave feeling relaxed and taken care of. My teeth & gums have never been cleaner." "I would definitely recommend Soft Touch Dental to any one looking for an honest, and caring dentist who is passionate about her job." "Dr. Rayet did excellent work, it was the least painful dentist visit ever. My teeth look great, they matched the color of the crowns and I even avoided a root canal!"